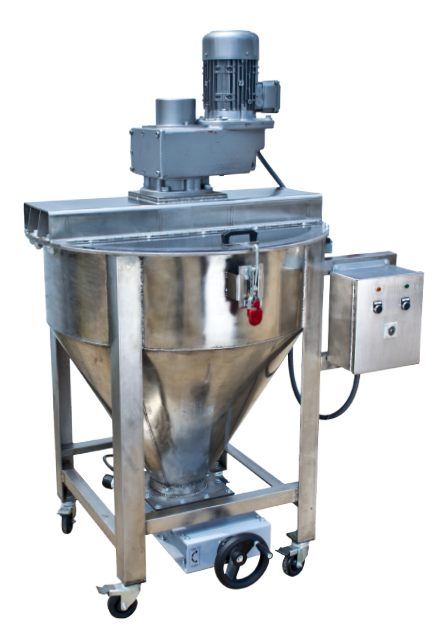 The Eagle Verti-Mix is a rugged batch mixer designed for fast mixing of dry powder materials. Mixing action is developed by a helical shaped, spiral mixing ribbon that keeps materials in constant mixing motion. Mix rates of 8 minutes or less per batch are the norm. 10-200 20 800 7.5 hp, 240/480v, 3 ph, 60 hz 44” x 44” 48” 10” 62” 480 lbs. 3ph, 60 hz 44” x 44” 48” 10” 82” 850 lbs. 3 ph, 60 hz 44” x 44” 48” 10” 119” 1200 lbs.